Who’s Following the Stock Market? One of the questions we ask consumers in our monthly Consumer Pulse survey is if they follow the stock market on a regular basis. 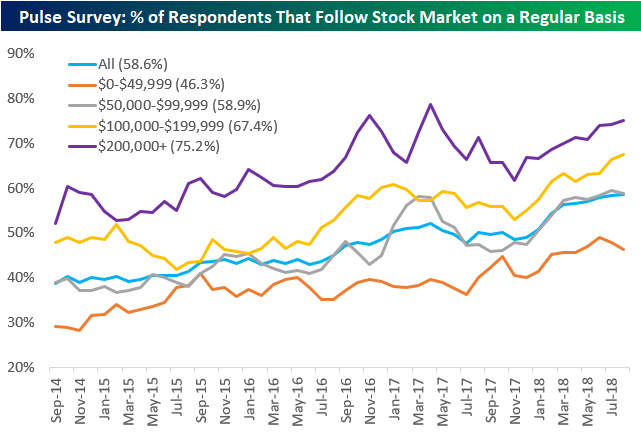 Since we began running our Pulse survey in 2014, the percentage of respondents that follow the stock market has steadily ticked higher to its current level of 58.6% (as of August). This is generally to be expected given that the stock market has also steadily ticked higher since 2014, but we really don’t know what would happen during a bear market because we haven’t had a bear market in nine years. Below is a breakdown of interest in the stock market by annual income bracket. They say that the stock market is only for the wealthy, so let’s see what the numbers show. The highest income bracket in our survey ($200k+) has had the highest percentage of interest in the stock market every month since we began running our survey in 2014. In the most recent month, 75.2% of consumers with incomes above $200k said they follow the stock market on a regular basis. This is not quite at an all-time high, though, even with the S&P 500 recently trading to new all-time highs. April 2017 is when stock market interest for the highest income bracket hit its highest level in our survey at just over 78%. As might be expected, the higher the income, the more interest in the stock market. The $100,000-$199,999 bracket has the 2nd highest interest in the stock market at 67.4%, followed by the $50,000-$99,999 bracket at 58.9%. The lowest income bracket ($0-$49,999) has the lowest interest in the stock market, but at 46.3%, nearly a majority of the group says they follow the stock market on a regular basis. As you can see in the chart, interest in the stock market has picked up across all income brackets over the last four years. Bespoke’s Consumer Pulse Report is an analysis of a huge consumer survey that we run each month. Our goal with this survey is to track trends across the economic and financial landscape in the US. Using the results from our proprietary monthly survey, we dissect and analyze all of the data and publish the Consumer Pulse Report, which we sell access to on a subscription basis. Sign up for a 30-day free trial to our Bespoke Consumer Pulse subscription service. With a trial, you’ll get coverage of consumer electronics, social media, streaming media, retail, autos, and much more. The report also has numerous proprietary US economic data points that are extremely timely and useful for investors. We’ve just released our most recent monthly report to Pulse subscribers, and it’s definitely worth the read if you’re curious about the health of the consumer in year two of Trump’s economy. Start a 30-day free trial for a full breakdown of all of our proprietary Pulse economic indicators.